Largest telecom PSU BSNL under FTTH services introduced two Unlimited Combo Broadband plans which offers 50Mbps and 100Mbps Bandwidth across the country on regular basis. Business Telecom and 4G Technology provider Bharat Sanchar Nigam Limited (BSNL) has decided to regularize the FTTH (Fiber to the Home) Combo Unlimited FMC plans Rs.777 and Rs.1277 in all the circles (except in Andaman and Nicobar Islands) with immediate effect. 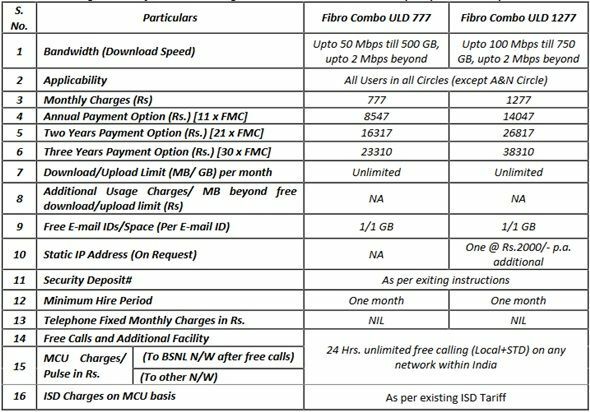 As per latest information, Unlimited FTTH Broadband plans Fibro Combo ULD 777 offers 50Mbps download speed whereas Fibro Combo ULD 1277 offers download speed upto 100Mbps to new and existing subscribers across India. On Monthly rental Unlimited FTTH Broadband plan of Rs.777/- connection subscribers can access internet speed upto 50Mbps till 500GB and beyond the limit speed reduced to 2Mbps following Fair Usage Policy. Another Monthly rental Unlimited FTTH Broadband plan of Rs.1277/- connection subscribers can access internet speed upto 100MBps till 750GB and beyond the limit speed reduced to 2Mbps following FUP. As well Broadband customers will also get additional option of 24hours Free Unlimited free voice calling (Local/STD) to any network within India. BSNL will collect Security deposit charges at the time of new connection from Broadband plan subscribers. The above plans are offered in only those locations/areas of Circles where there is a matching competition from other telecom operators. The above plans will be implemented with immediate effect following terms and conditions.